TEHRAN, Iran -- At least 12 people have been killed in the ongoing protests in Iran, and armed protesters have tried to take over police stations and military bases, state TV reported Monday. The protests -- the largest to strike Iran in nearly a decade -- began Thursday in Mashhad over economic issues and have since expanded to several cities, with some protesters chanting against the government and the supreme leader, Ayatollah Ali Khamenei. Hundreds of people have been arrested. The state TV report said 10 were killed during clashes Sunday night, without elaborating. Two demonstrators were killed during a protest in western Iran late Saturday. "Some armed protesters tried to take over some police stations and military bases but faced serious resistance from security forces," state TV reported. It did not say where those attacks occurred. State TV aired images of burning buildings, as well as an ambulance crew trying to aid a wounded person amid a crowd of shouting people. It also showed a fire truck that appeared to have been attacked and burned. Later Monday, state TV said six people were killed in the western town of Tuyserkan, 185 miles southwest of Tehran. It said three others were killed in the town of Shahinshahr, 195 miles south of Tehran. It did not say where the 10th person was killed. Earlier Monday, the semi-official ILNA news agency quoted Hedayatollah Khademi, a representative for the town of Izeh, as saying two people died there Sunday night. It was not clear if they were included in the state TV toll. He said the cause of death wasn't immediately known. Many in Izeh, some 280 miles southwest of Tehran, have hunting rifles in their homes. The unrest continued unabated on Sunday, despite a government move to block access to Instagram and a popular messaging app used by activists to organize, with even President Hassan Rouhani acknowledging the public's anger over the Islamic republic's flagging economy. "Those who misused cyberspace and spread violence are absolutely known to us and we will definitely confront them," Iranian Interior Minister Abdolreza Rahmani Fazli said on state television. Rouhani and other leaders made a point to warn that the government wouldn't hesitate to crack down on those it considers lawbreakers amid the demonstrations. The protests in the Iranian capital, as well as President Trump tweeting in support of them, raised the stakes. It also apparently forced state television to break its silence about the unrest, acknowledging Saturday that it hadn't reported on the protests on orders from security officials. Mr. Trump, whose travel bans have blocked Iranians from getting U.S. visas, in his latest tweets on Sunday showed support for the protesters and for their ability to communicate. "The people are finally getting wise as to how their money and wealth is being stolen and squandered on terrorism. Looks like they will not take it any longer," Mr. Trump wrote. "The USA is watching very closely for human rights violations!" Rouhani criticized Mr. Trump in comments broadcast Sunday night. "This guy in America who wants to sympathize with our people today has forgotten that he had called Iranian people 'terrorists' a few months ago," Rouhani said. "This person who is against Iran from head to toe does not have the right to be sympathetic to Iranian people." The outpouring of public discontent -- the most widespread since protests following Iran's disputed 2009 presidential election -- have been fanned by messages sent on the Telegram messaging app, which authorities blocked Sunday along with the photo-sharing app Instagram, which is owned by social media giant Facebook. Many of the country's 80 million people are learning about the protests and sharing images of them through Telegram. On Saturday, Telegram shut down one channel of the service over Iranian government allegations that it encouraged violence, which its moderator denied. On Sunday, Telegram CEO Pavel Durov wrote on Twitter that authorities had blocked all access to the app. 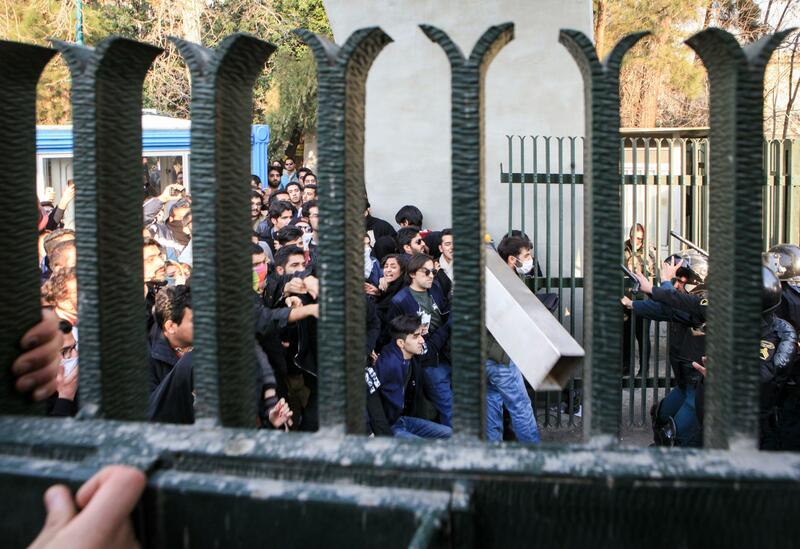 "Iranian authorities are blocking access to Telegram for the majority of Iranians after our public refusal to shut down ... peacefully protesting channels," he wrote. Iran's state TV news website, iribnews.ir, said social media in Iran was being temporarily limited as a safety measure. "With a decision by the Supreme National Security Council, activities of Telegram and Instagram are temporarily limited," the report said, without elaborating. Facebook, based in Menlo Park, California, declined to comment. Facebook itself has been banned in Iran since the 2009 protests that followed the re-election of hard-line President Mahmoud Ahmadinejad. However, some in Iran access it and other banned websites using virtual private networks.